You can keep a copy of your item file locally and use it to simplify the creation of Web pages for your online store. When you connect the item file in FrontPage you give the NetStores objects the information needed to properly handle your products. For example, an Add-to-Cart button needs information about the item it adds to the customer's shopping cart. When you insert an Add-to-Cart button in a Web page you can select the product code from a pull-down menu. Now you can easily set up your Web store to sell the products listed in your item file to your customers. As you produce new products for your Web store, you need to add them to your item file and synchronize it with the one at NetStores. To synchronize your official online-store product information with your current products (see item file, Step 4 editing), you export a properly formatted copy of your product list to a tab delimited text file (itemfile.txt). Then, in FrontPage or in the Merchant Administration Area at the NetStores Web site, you upload this file to the NetStores server (see item file, Step 5 uploading). After you have uploaded your new item file, you can sell the newly included products to your customers. 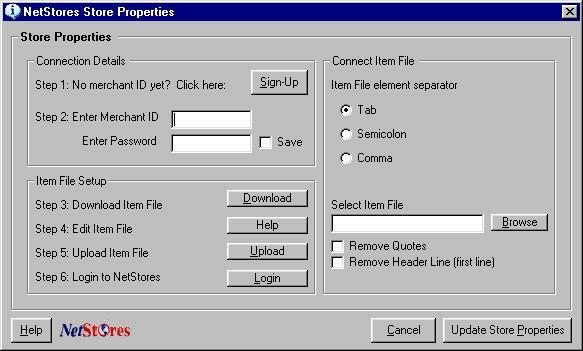 Your store properties are contained in a file named NetStoresPropertiesFP.nts in the root directory of your current web on your local computer. Thus, you can have multiple configurations (Merchant ID's, etc. ), for several different webs. You can not, however, create NetStores parameters without a web. If you have followed steps 1-7, you are ready to start using NetStores objects, such as Add to Cart and Search in FrontPage.